Monolayer Blown Film Machine gives high output up to 280 kg/hr with thickness ranging from 8 microns to 150 microns and a maximum film width of 2500 mm. Monolayer Blown Film Machine is a cost effective investment of producing single layer barrier films and mono layer blown film lines as well. For packaging industries that requires greater productivity in low investment and low power consumption, monolayer blown film machine is the right option as this equipment offers high speed production solution. It is an effective investment solution for packaging sector as they can get back good return on what they spend. The manufacture of plastic film for products such as?shopping bags?and continuous sheeting is achieved using a?blown film?line. This process is the same as a regular extrusion process up until the die. There are three main types of dies used in this process: annular (or crosshead), spider, and spiral. Annular dies are the simplest, and rely on the polymer melt channeling around the entire cross section of the die before exiting the die; this can result in uneven flow. Spider dies consist of a central mandrel attached to the outer die ring via a number of "legs"; while flow is more symmetrical than in annular dies, a number of weld lines are produced which weaken the film. Spiral dies remove the issue of weld lines and asymmetrical flow, but are by far the most complex. Blown Film Plant such as Plastic Reprocess Plant, Plastic Waste Recycling Plant, Plastic Recycling Machine, Raffia Waste Reprocess Plant, Extruder For Waste Plastic Recycling, Drinking Straw Machine. Blown Film Plant is the process of recovering scrap or waste PLASTIC and reprocessing the material into useful products. This helps to reduce the high rates of plastic pollution. Blown Film Plant includes taking any type of plastic sorting it into different polymers and then chipping it and then melting it down into pellets after this stage it can then be used to make items of any kind such as plastic chairs and tables. Soft Plastics are also recycled such as polyethylene film and bags. Monolayer Blown Film Machine in Ahmedabad is a technology that is the most common method to make plastic films, especially for the packaging industry. The process involves extruding a tube of molten polumer through a die and inflating to several times its initial diameter to form a thin film bubble. This bubble is then collapsed and used as a lay-flat film or can be made into bags. Usually polyethylene is used with this process, and other materials can be used as blends with these polymers. A diagram of a blowing film process. Typically, blown film extrusion is carried out vertically upwards, however horizontal and downward extrusion processes are now becoming more common. The polymer material starts in a pellet form, which are successively compacted and melted to form a continuous, viscous liquid . This molten plastic is then forced, or extruded , through an annular die. Air is injected through a hole in the center of the die , and the pressure causes the extruded melt to expand into a bubble. The air entering the bubble replaces air leaving it, so that even and constant pressure is maintained to ensure uniform thickness of the film. The bubble is pulled continually upwards from the die and a cooling ring blows air onto the film. The film can also be cooled from the inside using internal bubble cooling. This reduces the temperature inside the bubble, while maintaining the bubble diameter. After solidification t the frost line, the film moves into a set of nip rollers which collapse the bubble and flatten it into two flat film layers. The puller rolls pull the film onto windup rollers. The film passes through idler rolls during this process to ensure that there is uniform tension in the film. Between the nip rollers and the windup rollers, the film may pass through a treatment centre, depending on the application. During this stage, the film may be slit to form one or two films, or surface treated. Monolayer Blown Film Machine in Ahmedabad generally has a better balance of mechanical properties than cast or extruded films because it is drawn in both the transverse and machine directions. Mechanical properties of the thin film include tensile and flexural strength, and toughness. The nearly uniform properties in both directions allow for maximum toughness in the film. Automatic Blown Film Machine can be used to make one large film, two smaller ones, or tubes that can be made into bags. Also, one die can make many different widths and sizes without significant trimming. This high level of flexibility in the process leads to less scrap material and higher productivity. Blown films also require lower melting temperatures than cast extrusion. Measured at the die opening, the temperature of cast film is about 220°C., where as the temperature of blown film is about 135°C. Furthermore, the cost of the equipment is approximately 50% of a line. Monolayer Blown Film Plant in India is a technology that is the most common method to make plastic films, especially for the packaging industry. The process involves extruding a tube of molten polumer through a die and inflating to several times its initial diameter to form a thin film bubble. This bubble is then collapsed and used as a lay-flat film or can be made into bags. Usually polyethylene is used with this process, and other materials can be used as blends with these polymers. A diagram of a blowing film process. Typically, Monolayer Blown Film Plant in India is carried out vertically upwards, however horizontal and downward extrusion processes are now becoming more common. Blown film generally has a better balance of mechanical properties than cast or extruded films because it is drawn in both the transverse and machine directions. Mechanical properties of the thin film include tensile and flexural strength, and toughness. The nearly uniform properties in both directions allow for maximum toughness in the film. Monolayer Blown Film Plant in India can be used to make one large film, two smaller ones, or tubes that can be made into bags. Also, one die can make many different widths and sizes without significant trimming. This high level of flexibility in the process leads to less scrap material and higher productivity. Blown films also require lower melting temperatures than cast extrusion. Measured at the die opening, the temperature of cast film is about 220°C., where as the temperature of blown film is about 135°C. Furthermore, the cost of the equipment is approximately 50% of a line. Monolayer Blown Film Machine Manufacturer. The offered blown film plant is used for making the plastic film or sheet. This blown film plant is manufactured by optimum grade raw material and sophisticated technology in synchronization with set standard. Offered blown film plant is examined under the direction of professionals to ensure the flawlessness. Monolayer Blown Film Machine Manufacturer. The provided blown film plant is available in different specifications as per the requirements of our esteemed clients. This blown film plant offered by us is manufactured with premium grade material and highly modern technology in sync with the market standards. Customers can avail this blown film plant from us at affordable rates. Singal Layer Blown Film Machine is a technology that is the most common method to make plastic films, especially for the packaging industry. The process involves extruding a tube of molten polumer through a die and inflating to several times its initial diameter to form a thin film bubble. This bubble is then collapsed and used as a lay-flat film or can be made into bags. Usually polyethylene is used with this process, and other materials can be used as blends with these polymers. A diagram of a blowing film process. Singal Layer Blown Film Machine has a better balance of mechanical properties than cast or extruded films because it is drawn in both the transverse and machine directions. Mechanical properties of the thin film include tensile and flexural strength, and toughness. The nearly uniform properties in both directions allow for maximum toughness in the film. Singal Layer Blown Film Machine can be used to make one large film, two smaller ones, or tubes that can be made into bags. Also, one die can make many different widths and sizes without significant trimming. This high level of flexibility in the process leads to less scrap material and higher productivity. Blown films also require lower melting temperatures than cast extrusion. Measured at the die opening, the temperature of cast film is about 220°C., where as the temperature of blown film is about 135°C. Furthermore, the cost of the equipment is approximately 50% of a line. Blown Film Plant is a technology that is the most common method to make plastic films, especially for the packaging industry. The process involves extruding a tube of molten polumer through a die and inflating to several times its initial diameter to form a thin film bubble. This bubble is then collapsed and used as a lay-flat film or can be made into bags. Usually polyethylene is used with this process, and other materials can be used as blends with these polymers. A diagram of a blowing film process. Blown Film Plant generally has a better balance of mechanical properties than cast or extruded films because it is drawn in both the transverse and machine directions. Mechanical properties of the thin film include tensile and flexural strength, and toughness. The nearly uniform properties in both directions allow for maximum toughness in the film. Blown Film Plant can be used to make one large film, two smaller ones, or tubes that can be made into bags. Also, one die can make many different widths and sizes without significant trimming. This high level of flexibility in the process leads to less scrap material and higher productivity. Blown films also require lower melting temperatures than cast extrusion. Measured at the die opening, the temperature of cast film is about 220°C., where as the temperature of blown film is about 135°C. Furthermore, the cost of the equipment is approximately 50% of a line. Singal Layer Blown Film Plant such as Plastic Reprocess Plant, Plastic Waste Recycling Plant, Plastic Recycling Machine, Raffia Waste Reprocess Plant, Extruder For Waste Plastic Recycling, Drinking Straw Machine. Singal Layer Blown Film Plant is the process of recovering scrap or waste PLASTIC and reprocessing the material into useful products. This helps to reduce the high rates of plastic pollution. Singal Layer Blown Film Plant includes taking any type of plastic sorting it into different polymers and then chipping it and then melting it down into pellets after this stage it can then be used to make items of any kind such as plastic chairs and tables. Soft Plastics are also recycled such as polyethylene film and bags. 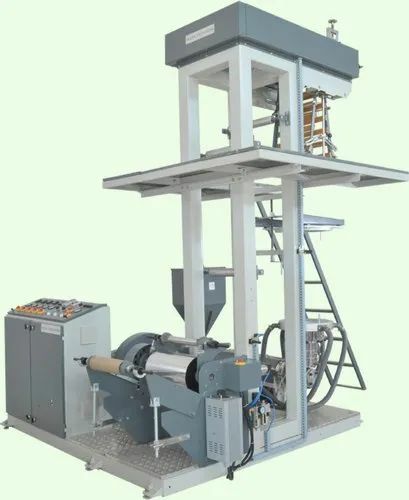 Monolayer Extrusion Blown Film Machine is a technology that is the most common method to make plastic films, especially for the packaging industry. The process involves extruding a tube of molten polumer through a die and inflating to several times its initial diameter to form a thin film bubble. This bubble is then collapsed and used as a lay-flat film or can be made into bags. Usually polyethylene is used with this process, and other materials can be used as blends with these polymers. A diagram of a blowing film process. Typically, Monolayer Extrusion Blown Film Machine is carried out vertically upwards, however horizontal and downward extrusion processes are now becoming more common. Monolayer Extrusion Blown Film Machine generally has a better balance of mechanical properties than cast or extruded films because it is drawn in both the transverse and machine directions. Mechanical properties of the thin film include tensile and flexural strength, and toughness. The nearly uniform properties in both directions allow for maximum toughness in the film. Monolayer Extrusion Blown Film Machine can be used to make one large film, two smaller ones, or tubes that can be made into bags. Also, one die can make many different widths and sizes without significant trimming. This high level of flexibility in the process leads to less scrap material and higher productivity. Blown films also require lower melting temperatures than cast extrusion. Measured at the die opening, the temperature of cast film is about 220°C., where as the temperature of blown film is about 135°C. Furthermore, the cost of the equipment is approximately 50% of a line. Blown Film Machine such as Plastic Reprocess Plant, Plastic Waste Recycling Plant, Plastic Recycling Machine, Raffia Waste Reprocess Plant, Extruder For Waste Plastic Recycling, Drinking Straw Machine. Blown Film Machine is the process of recovering scrap or waste PLASTIC and reprocessing the material into useful products. This helps to reduce the high rates of plastic pollution. Blown Film Machine includes taking any type of plastic sorting it into different polymers and then chipping it and then melting it down into pellets after this stage it can then be used to make items of any kind such as plastic chairs and tables. Soft Plastics are also recycled such as polyethylene film and bags. Monolayer Blown Film Extrusion Machine. The offered blown film plant is used for making the plastic film or sheet. This blown film plant is manufactured by optimum grade raw material and sophisticated technology in synchronization with set standard. Offered blown film plant is examined under the direction of professionals to ensure the flawlessness. Monolayer Blown Film Extrusion Machine. The provided blown film plant is available in different specifications as per the requirements of our esteemed clients. This blown film plant offered by us is manufactured with premium grade material and highly modern technology in sync with the market standards. Customers can avail this blown film plant from us at affordable rates. Monolayer Blown Film Making Machine is a technology that is the most common method to make plastic films, especially for the packaging industry. The process involves extruding a tube of molten polumer through a die and inflating to several times its initial diameter to form a thin film bubble. This bubble is then collapsed and used as a lay-flat film or can be made into bags. Usually polyethylene is used with this process, and other materials can be used as blends with these polymers. A diagram of a blowing film process. Typically, Monolayer Blown Film Making Machine extrusion is carried out vertically upwards, however horizontal and downward extrusion processes are now becoming more common. Monolayer Blown Film Making Machine extrusion can be used to make one large film, two smaller ones, or tubes that can be made into bags. Also, one die can make many different widths and sizes without significant trimming. This high level of flexibility in the process leads to less scrap material and higher productivity. Blown films also require lower melting temperatures than cast extrusion. Measured at the die opening, the temperature of cast film is about 220°C., where as the temperature of blown film is about 135°C. Furthermore, the cost of the equipment is approximately 50% of a line. Monolayer Blown Film Line. The offered blown film plant is used for making the plastic film or sheet. This blown film plant is manufactured by optimum grade raw material and sophisticated technology in synchronization with set standard. Offered blown film plant is examined under the direction of professionals to ensure the flawlessness. Monolayer Blown Film Line. The provided blown film plant is available in different specifications as per the requirements of our esteemed clients. This blown film plant offered by us is manufactured with premium grade material and highly modern technology in sync with the market standards. Customers can avail this blown film plant from us at affordable rates. Monolayer Blown Film Plant is a technology that is the most common method to make plastic films, especially for the packaging industry. The process involves extruding a tube of molten polumer through a die and inflating to several times its initial diameter to form a thin film bubble. This bubble is then collapsed and used as a lay-flat film or can be made into bags. Usually polyethylene is used with this process, and other materials can be used as blends with these polymers. A diagram of a blowing film process. Typically, blown film extrusion is carried out vertically upwards, however horizontal and downward extrusion processes are now becoming more common . • The polymer material starts in a pellet form, which are successively compacted and melted to form a continuous, viscous liquid . This molten plastic is then forced, or extruded , through an annular die. • Air is injected through a hole in the center of the die , and the pressure causes the extruded melt to expand into a bubble. The air entering the bubble replaces air leaving it, so that even and constant pressure is maintained to ensure uniform thickness of the film. • The bubble is pulled continually upwards from the die and a cooling ring blows air onto the film. The film can also be cooled from the inside using internal bubble cooling. This reduces the temperature inside the bubble, while maintaining the bubble diameter . • After solidification t the frost line, the film moves into a set of nip rollers which collapse the bubble and flatten it into two flat film layers. The puller rolls pull the film onto windup rollers. The film passes through idler rolls during this process to ensure that there is uniform tension in the film. Between the nip rollers and the windup rollers, the film may pass through a treatment centre, depending on the application. During this stage, the film may be slit to form one or two films, or surface treated. Monolayer Blown Film Plant generally has a better balance of mechanical properties than cast or extruded films because it is drawn in both the transverse and machine directions. Mechanical properties of the thin film include tensile and flexural strength, and toughness. The nearly uniform properties in both directions allow for maximum toughness in the film . Blown Film Extrusions Plant extrusion can be used to make one large film, two smaller ones, or tubes that can be made into bags. Also, one die can make many different widths and sizes without significant trimming. This high level of flexibility in the process leads to less scrap material and higher productivity. Blown films also require lower melting temperatures than cast extrusion. Measured at the die opening, the temperature of cast film is about 220°C., where as the temperature of blown film is about 135°C. Furthermore, the cost of the equipment is approximately 50% of a line. Monolayer Layer Blown Film Machine is a technology that is the most common method to make plastic films, especially for the packaging industry. The process involves extruding a tube of molten polumer through a die and inflating to several times its initial diameter to form a thin film bubble. This bubble is then collapsed and used as a lay-flat film or can be made into bags. Usually polyethylene is used with this process, and other materials can be used as blends with these polymers. A diagram of a blowing film process. Typically, Monolayer Layer Blown Film Machine is carried out vertically upwards, however horizontal and downward extrusion processes are now becoming more common . Blown film generally has a better balance of mechanical properties than cast or extruded films because it is drawn in both the transverse and machine directions. Mechanical properties of the thin film include tensile and flexural strength, and toughness. The nearly uniform properties in both directions allow for maximum toughness in the film . Monolayer Blown Film Machine in India is a technology that is the most common method to make plastic films, especially for the packaging industry. The process involves extruding a tube of molten polumer through a die and inflating to several times its initial diameter to form a thin film bubble. This bubble is then collapsed and used as a lay-flat film or can be made into bags. Usually polyethylene is used with this process, and other materials can be used as blends with these polymers. A diagram of a blowing film process. Monolayer Blown Film Machine in India generally has a better balance of mechanical properties than cast or extruded films because it is drawn in both the transverse and machine directions. Mechanical properties of the thin film include tensile and flexural strength, and toughness. The nearly uniform properties in both directions allow for maximum toughness in the film. Monolayer Blown Film Machine in India can be used to make one large film, two smaller ones, or tubes that can be made into bags. Also, one die can make many different widths and sizes without significant trimming. This high level of flexibility in the process leads to less scrap material and higher productivity. Blown films also require lower melting temperatures than cast extrusion. Measured at the die opening, the temperature of cast film is about 220°C., where as the temperature of blown film is about 135°C. Furthermore, the cost of the equipment is approximately 50% of a line. Looking for “Monolayer Blown Film Machine”?